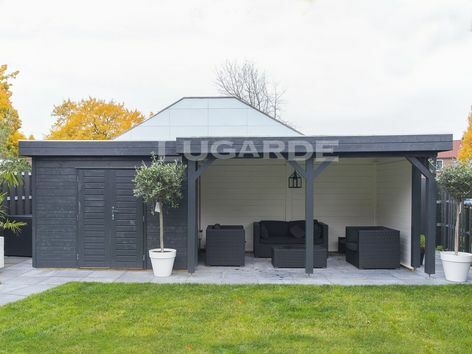 The Lugarde Prima Edward is a large summerhouse with double solid door, ideal for storage. To the side is a covered seating area which is sheltered on three sides and with 3 pine posts to the front. 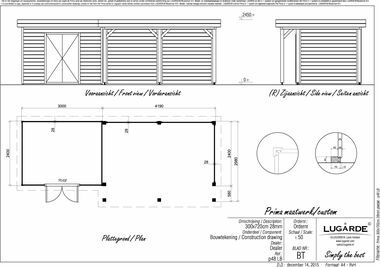 Approximate overall size 7.2m x 3m in 28 mm log thickness. The standard package includes 1 x PE45F double solid door. The cabin measures 3m x 2.4m and the canopy measures 4.2m x 3m.